Feeling SO loved by all of our family & friends! 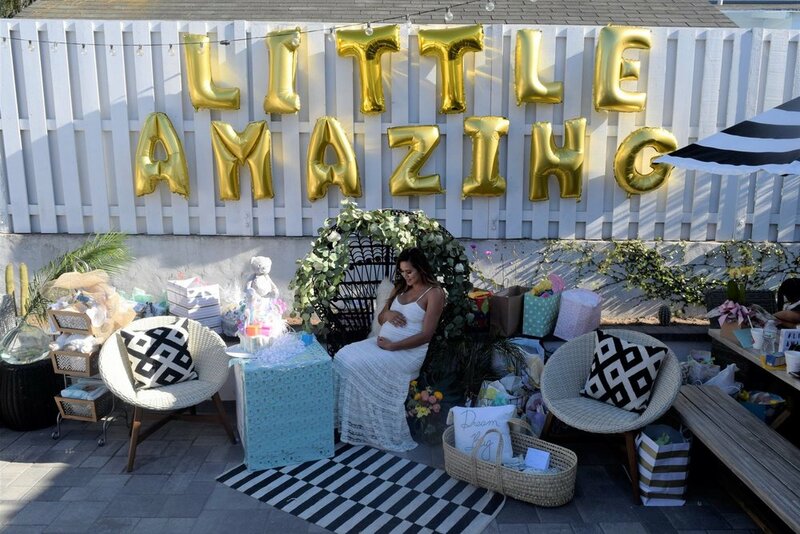 @LittleAmazing is such a blessed baby! It's still so surreal to me to think that almost a year ago I was celebrating my Bachelorette Party in Palm Springs and now, I'm married to Mr. Amazing, living in our first home with a baby on the way! What a whirlwind year it's been! 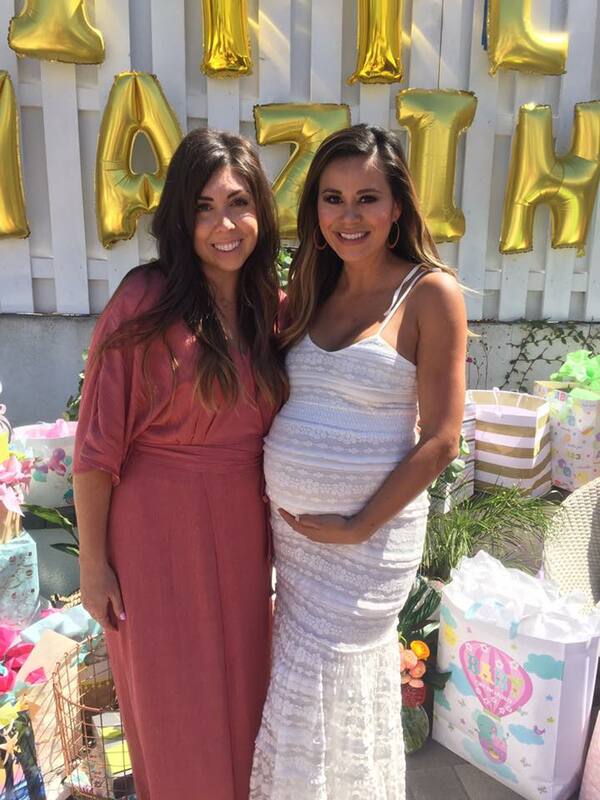 I am so incredibly grateful to have had two baby showers hosted for me. My mom hosted a shower in my hometown of Sierra Vista, AZ with my best friend, Jeff and sister, Sonya. 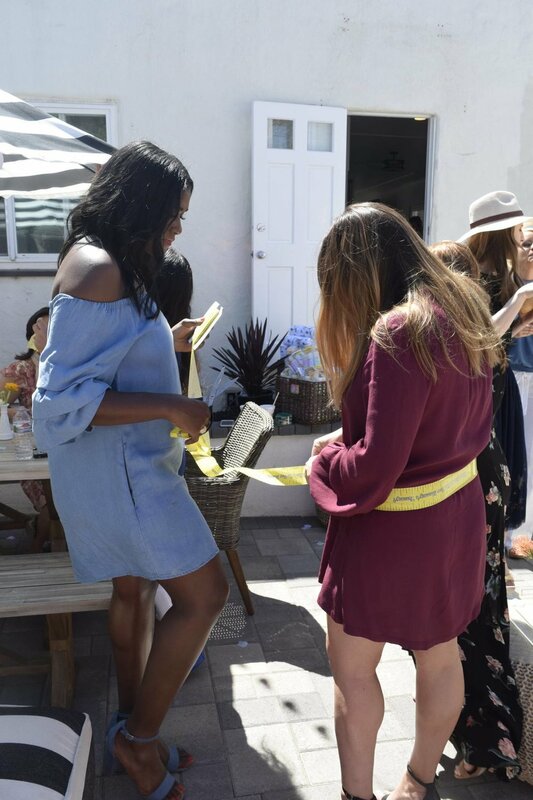 The theme was appropriately bumble bee and every detail from the food to the black & yellow candy bar and bumble bee cookies were perfection. It was intimate and extremely special. For my shower in LA, where I've called home for nearly 10 years I wanted the shower to be casual and laid back. I knew we'd have a big group of girls but I wanted it to still feel personal. Since we're waiting to find out the gender of @LittleAmazing, I didn't have a particular theme in mind-I just wanted the space to exude baby! The invitation designed by Kirra Reyna Designs really set the tone with the blue, green and pink pastel watercolors, clouds and stars. I just loved the softness of our invitations and signage and how there was something vintage about them. My friends who hosted, Ruth, Faith, Breelyn & my mother-in-law Nicole, carried that theme throughout the shower-stringing the most adorable handmade cloud mobile above the beverage cart and other cloud and star mobiles above the tables. I can't wait to use these in the nursery for decor (so stay tuned for our nursery reveal very soon). 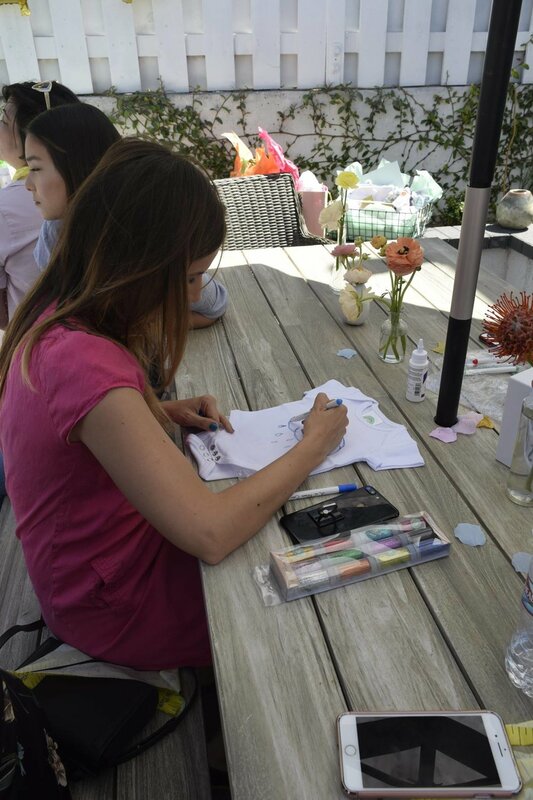 Guests were invited to "dress their guess: blue or pink, what do you think?" It was pretty split on thinking the baby will be a girl or boy. The gold balloons and black and white patio furniture was a good neutral backdrop for the rest of the decor. Silver dollar eucalyptus and white garden roses weaved through the black wicker peacock chair made it the absolute centerpiece of the party which made me feel like a bohemian Queen! I knew I wanted to wear white (my favorite color) and was so happy to find this lace maxi which I paired with my new favorite heels (they have velcro straps which are perfect for this mama-to-be's growing belly)! 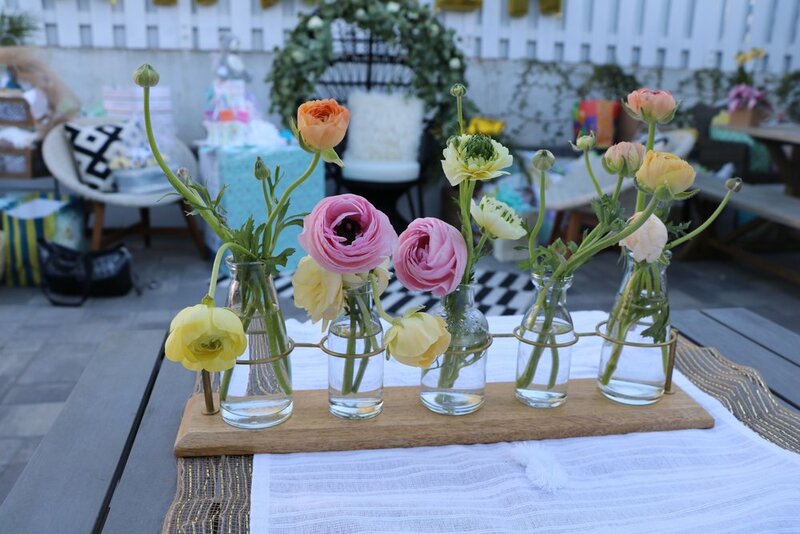 The day before the shower I went to the LA Flower Mart and picked up my favorite peonies, colorful ranunculus and dahlia flowers to decorate the tables. I love having fresh flowers at the house and these made me so happy! 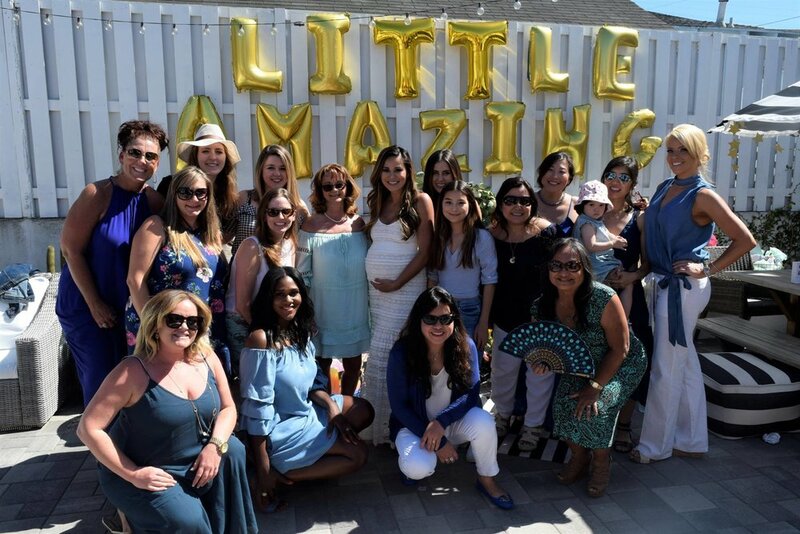 The theme for the menu was all of my pregnancy cravings-although I don't know if I really have had any true cravings since I just eat everything I've always enjoyed-lol! 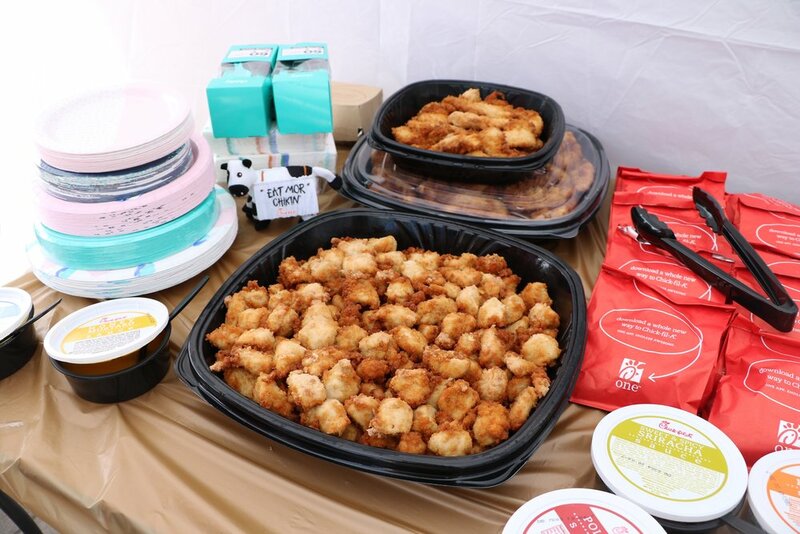 Guests were treated to catered Chick-Fil-A sandwiches, nuggets tenders and salad. We had southern sweet tea, lemonade and fresh coconuts for refreshments and a make-your-own bubbles bar. 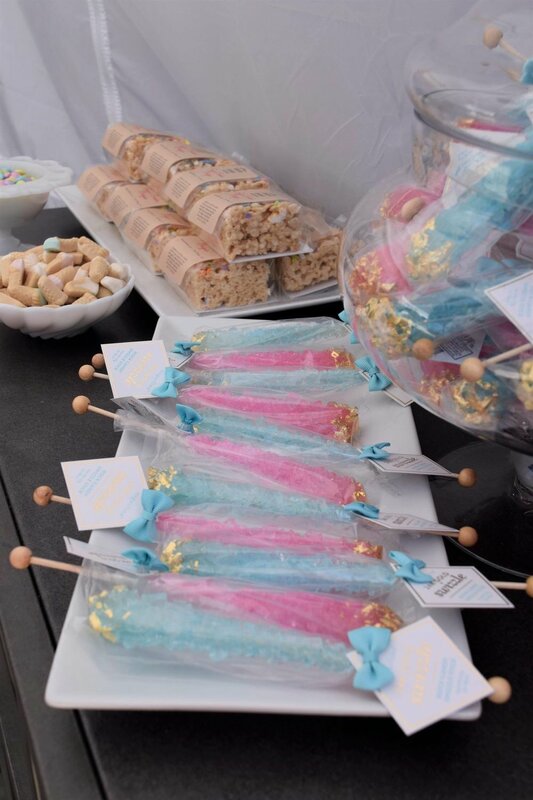 The dessert table included a ton of sweets including a rosé gummies station! 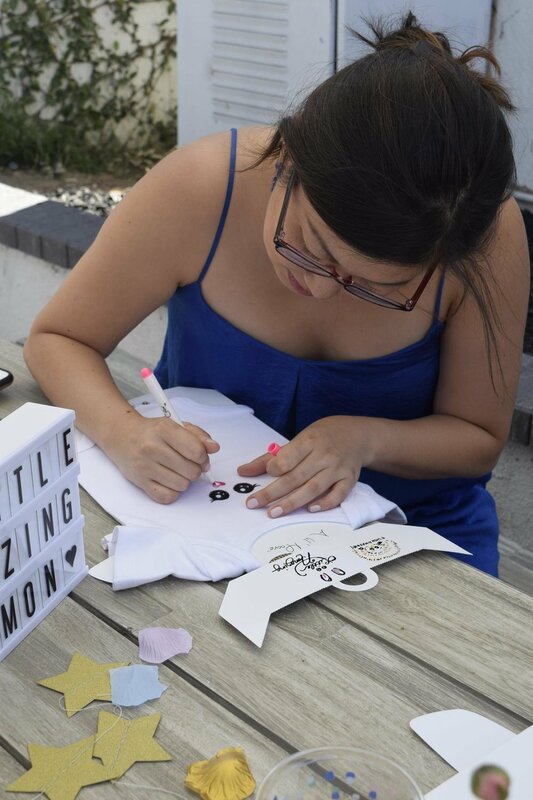 Guests played games and decorated onesies using a DIY onesie decorating kit from A lil' Moore complete with paint, iron-on stickers and decals. 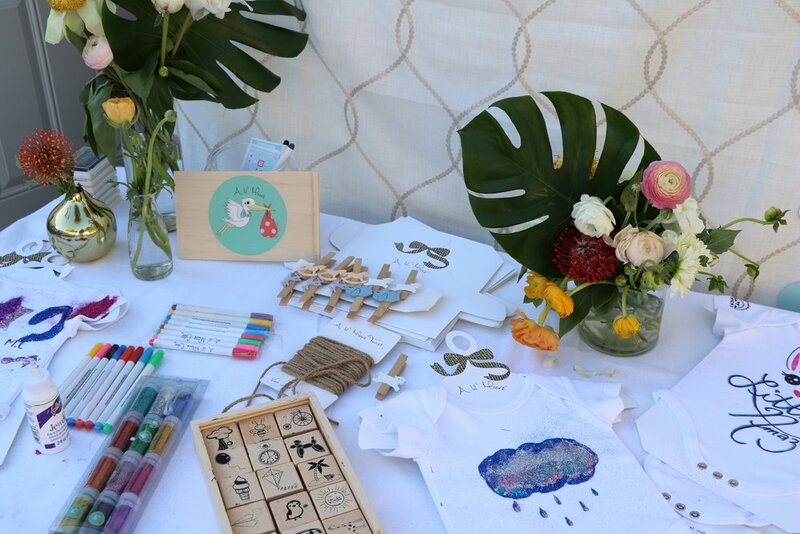 Favors included super soft aden + anais swaddles which double as sarongs, beach blankies and hair wraps (for guests who don't have little ones yet) and I also gifted guests my favorite natural and organic skin care products from California Baby-a staple at the Milloy-Simon household! Scroll down to see some of my favorite photos and then be sure to check out the full feature on POPSUGAR! Special thanks to my bestie, Breelyn Stone for taking all of the photography at my shower.